My apartment is tragically lacking in good, natural lighting – especially after 4ish in the afternoon. This made it hard to take good pics of the materials for my Phoebe Dress before I cut into it. The pic above is quite accurate when it comes to colours, so it will have to do for now. 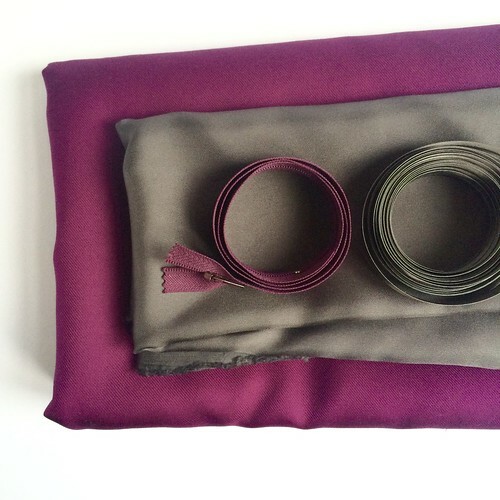 The purple is a lovely, medium weight silk twill, and the grey is a thinner silk to serve as the lining. I’ve been way too precious about these fabrics for much too long… they have been in my stash for probably three years. I thought they were from my 2013 Paris trip (the only reason I remember when that was, is that I blogged about it), but the post with all the fabrics from that trip does not contain these fabrics. To my great shame that means that this fabric is probably even a year older than this. To my even greater shame, looking back at that post made me realise that I haven’t used ANY of those fabrics. Because I have 3 metres of the main fabric, and I’m no longer very attached to it, I’m not going to make a muslin. I did a quick tissue fitting to see if there were any major problems, but I think it will be alright. 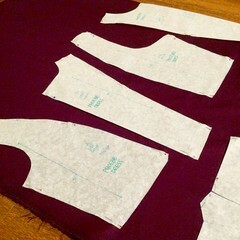 I will, however, baste the whole dress together for a fitting before stitching it properly. Based on my measurements (34/27/38) I graded from a size 2 in the bust to a 4 in the waist and to a 6 in the hips. This dress will probably be way too fancy for any everyday occasion, but the other day I had to go to a fancy party, and realised that I got rid of almost all my dresses. Hopefully this will be a good addition to my closet again.